In March, Toys Я Us put out this little Lego polybag. I normally wouldn't pay much attention to them, but Rustin always gets such cool things for his Spoils of the Week column that I've begun glancing at these tiny sets when I'm at the store. Slippery slope! 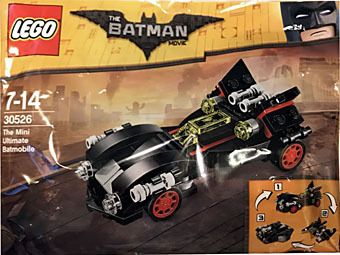 This Batmobile is apparently based on The Lego Batman Movie, judging by the branding at the top of the package, but the design is timeless enough to fit with any era - this would work equally well in comics, movies, or videogames. 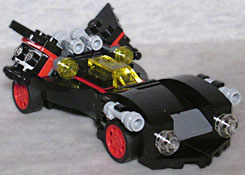 The shape seems to take inspiration from the Tim Burton Batmobile, with the huge, curving fenders over the front wheels, the long canopy in the center, and the angled flaps at the back. The colors, meanwhile, are lifted directly from the Adam West Batmobile: yes, it's mostly black, but the hubcaps on the wheels and the stripes on the side are a vibrant, eye-catching red. The canopy is trans yellow, there are clear headlights, and a grill/ram on the front that's grey. There are four gray lightsaber hilts used as guns on the front and roof, and two trans yellow studs flanking the cockpit that would probably be more missiles on the real design. The bag says this set has 84 pieces, and after the half hour it took to build the car, there were 14 extras let over - using complicated, high-level math performed thanks to rented processing time on NASA supercomputers, that tells us the car is built from 70 pieces. It's about 3½" long, 2" wide and 1⅜" tall, and the wheels actually roll. That's not the end of the story, though. The bag promotes that you can build three different vehicles with the included pieces, which is what sold me on the set. Unfortunately, the instruction sheet only includes the 24 steps to build the car - as with the Lego Dimensions sets, you can only get the rest of the instructions online. Thanks, guys: nothing says "permanent, low-tech fun" like needing an internet connection to fully utilize one's building blocks. The second model is the Batwing, a cute little plane similar (but not identical) to the one from Dark Knight Rises, in that it's got a squat body with a dangling cockpit in the front, but there are also some Tim Burton hints here as well, with the actual bat-symbol-styled wings on the sides instead of just some helicopter blades underneath. Like the Bale Batplane and the Keaton Batplane had a Will Arnett Batplane baby. You can definitely tell this is one of the "secondary" models for the set, because it only takes 53 pieces to build, leaving a lot of leftovers. The red is still present in this mode, but it's much less noticeable. From the top. From the bottom (ie, the way most citizens of Gotham would see it), the red is right there. Though that may simply be due to the construction and not a representation of the way the real thing looks. We still get the black and greys, with clear and trans yellow studs on the wings for... lights? Weapons? Something. The wings and the tail fins are hinged for poseability, but the Mini Batwing will always have to ret on the ground - unless you take the three lightsabers that weren't used to make the plane's guns and use them to form a tripod under the belly. That'll only lift it a little, but it's enough. 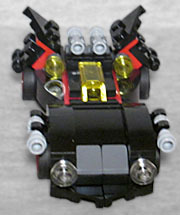 The third mode is a Bat-Tank, taking the place of the Tumbler. No, it doesn't really look at all like that vehicle - it's just that they both share the concept of "Batman drives a tank." 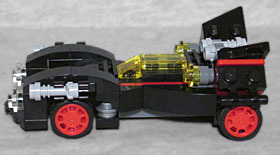 There are a few similarities, like the shape of the panels on the sides, and the fact that it has big wheels instead of treads, but this is definitely not an attempt to make the Tumbler in mini-Lego form. The tank is made from 69 pieces, but the options available in the set mean we don't get to see a lot of red here. You almost have to look down inside it to see anything. Viewed from the front, it's almost comically wide - its footprint is dictated by the brick that the wheels attach to, so there's no way to narrow it and still maintain the intended shape. If nothing else, you can tell this thing would be nearly impossible to knock over. 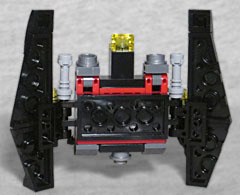 There's a larger version of the Bat-Tank available, which shows that there are two massive pop-up cannons concealed within those curved sections on the back, but re-creating that feature is beyond the scope of this scale, so all we get in the way of weapons are two lightsaber cannons on the top. Give them credit for still including the headlights on the front, though. 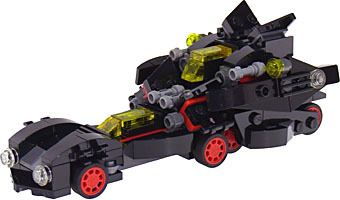 That alone would be fun enough, but just as the "Ultimate Batmobile" in Lego Batman was actually a combination of multiple Bat-vehicles, this one is too: the car, the plane, and the tank can all plug together to form one mighty ride! Allegedly. See, the packaging doesn't point this out anywhere. The online instructions don't point it out, either. The only way to know it is to guess. Which, okay, would be fine, except: there aren't enough parts in the set to build more than one vehicle at once. To fully take advantage of the design, you need to get three copies of the set, which will allow you to plug all the things together, and will also leave you with a ton of excess bricks. We understand why a simple $4 polybag release wouldn't have what you need to build three complete interlocking vehicles, but still: this is something that would have been really nice to know back when Toys Я Us was still a thing. Because I'm not about to buy the big full-sized set, but I might have gotten two more of this polybag when I had the opportunity.